But resistance is rapidly escalating. David Archambault II, the tribal chairman of the Standing Rock Sioux, calls it the “black snake”: a 1,172 mile-long pipeline slated to carry crude oil fracked out of the Bakken formation in North Dakota to southern Illinois, where it will be routed to refineries on the Gulf Coast. Once the pipeline is operational, half a million gallons will flow each day along a route that crosses through farmland and wildlife habitat and beneath several major rivers, including the Missouri. Construction crews are preparing to bore beneath the riverbed just upstream from the Standing Rock reservation, which relies on the river for drinking water and irrigation. The pipeline has also been called the “new Keystone”—initially because it’s just a few miles shorter than that rejected project, and now because it’s sparking a similar resistance. 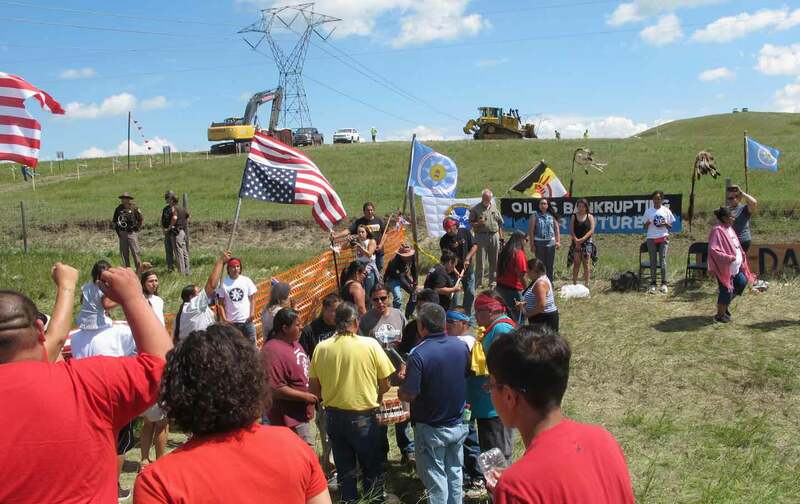 Despite a months-long campaign against the pipeline led by Native American activists, landowners, and environmental groups, the Army Corps of Engineers gave final approval for the project at the end of July. Since then, the opposition has escalated dramatically. In the past week more than two dozen protesters have been arrested for blocking access to the construction site near the Standing Rock reservation. The Bismarck Tribune estimates that at least 500 to 600 people have gathered to protest—some on horseback, many of them camping overnight—near Cannon Ball, North Dakota, with more arriving by the busload. Hundreds of people have gathered to protest near Cannon Ball, ND, with more arriving by the busload. A central concern is what a leak in the pipeline might do to the water and their ancestral land. One of the project’s stakeholders, Enbridge, was responsible for one of the worst inland oil spills in American history, a 1.2 million-gallon disaster that contaminated the Kalamazoo River in 2010. Though the pipeline is a for-profit project owned by a private company, it’s designated as a utility, which means the Army Corps of Engineers did not have to do a full environmental-impact statement before approving the project, Mother Jones notes. The track record of other pipelines in the region is not encouraging. Consider the Keystone I pipeline (part of a network that would have included the rejected Keystone XL): Built in 2010, it spilled a dozen times in its first year alone, and this past April leaked some 16,800 gallons of tar-sands oil onto a field in South Dakota. When InsideClimate News analyzed federal data on pipeline leaks in 2012, they found that only 5 percent of spills were detected by what’s touted as “state-of-the-art” remote-sensing systems. On Monday, Dakota Access LLC, the company behind the pipeline in question, filed a lawsuit against several protesters, including Archambault. Later that same day young activists swarmed the machinery, forcing a halt to construction that lasted through Tuesday, when the local sheriff held “peace talks” in the hope of resolving the standoff. Also Tuesday, a federal judge responded to the pipeline company’s suit with a restraining order that blocks protesters from interfering with the construction site or workers. But the activists aren’t planning to give up: Instead, they’re organizing more actions. 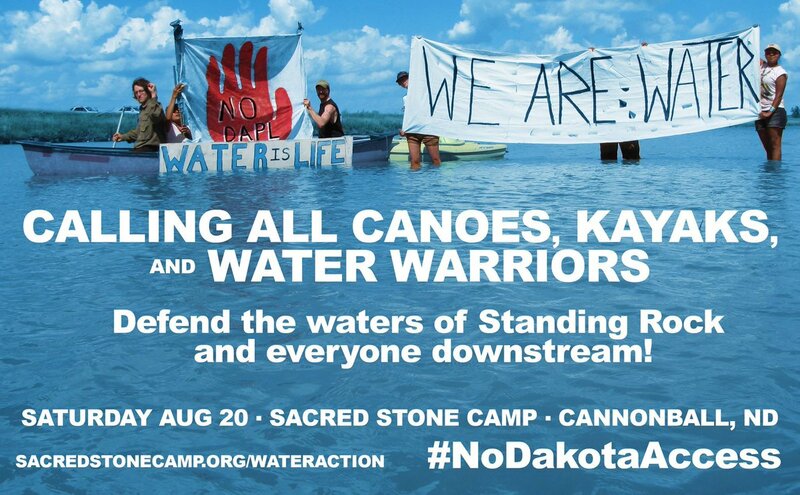 The Standing Rock Sioux have also asked a judge for a preliminary injunction against the Army Corps of Engineers for “a full halt to all construction activities and repeal of all USACE permits until formal tribal consultation and environmental review are properly and adequately conducted.” A hearing will be held in Washington, DC, on August 24. Meanwhile, in Des Moines, landowners and environmental activists rallied outside the headquarters of the Iowa Utilities Board, urging the board to appoint a liaison to deal with what one landowner previously described as “total disregard of the landowner, land, county inspector, Agricultural Impact Mitigation Plan and also environmental infractions” committed by the construction crews working on the pipeline. The board, consisting of three members appointed by the state’s Republican governor, voted in June to allow Dakota Access LLC to acquire hundreds of parcels of land via eminent domain. Several lawsuits have been filed over the seizure of farmland. Iowa authorities are also investigating what could be deliberate sabotage: three separate fires that caused nearly $1 million in damage to construction equipment being used on the pipeline route.